Family Therapy 6 Edition Note: This is the bound book only and does not include access to the Enhanced Pearson eText. To order the Enhanced Pearson eText packaged with a bound book, use ISBN 0133833720. 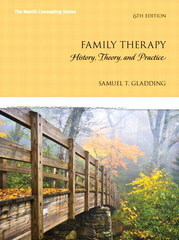 Considered the most thorough, well-written book in the field, Samuel T. Gladding’s, Family Therapy: History, Theory, and Practice, give readers clear coverage of all aspects of working with couples and families from proven, evidence-based theories. In a user-friendly organization and writing style, it covers important background information on healthy and functional families and different types of families, and includes an overview of how individual and family life cycles intertwine. The basic processes involved in treating couples and families are made clear, before delving into a dozen theoretical ways of treating families. The Enhanced Pearson eText features embedded video and internet resources. Improve mastery and retention with the Enhanced Pearson eText* The Enhanced Pearson eText provides a rich, interactive learning environment designed to improve student mastery of content. The Enhanced Pearson eText is: Engaging. The new interactive, multimedia learning features were developed by the authors and other subject-matter experts to deepen and enrich the learning experience. Convenient. Enjoy instant online access from your computer or download the Pearson eText App to read on or offline on your iPad® and Android® tablet. * Affordable. The Enhanced Pearson eText may be purchased stand-alone or with a loose-leaf version of the text for 40-65% less than a print bound book. *The Enhanced eText features are only available in the Pearson eText format. They are not available in third-party eTexts or downloads. *The Pearson eText App is available on Google Play and in the App Store. It requires Android OS 3.1-4, a 7” or 10” tablet, or iPad iOS 5.0 or later.